As if identifying promising dividend shares wasn’t tricky enough, knowing how to properly assemble the shares in a portfolio can be an even greater challenge. How do we assemble dividend shares in such a way that we maximise their value and utility? The good and bad news is that there’s not a single answer to this question, as much will depend on your unique objectives. Is your primary goal dividend growth & capital appreciation, or is it to harvest high levels of current income? Do you usually base your buy decisions on screening results or do you like to roll up your sleeves and research individual companies? Do you want to passively or actively manage your portfolio? Knowing the answer to these questions will help you evaluate what I consider the four broad approaches to dividend portfolio management. Let’s briefly look at each turn. In this approach, you decide how much income you want the portfolio to generate this coming year, list the forward yields of the shares you’d like to include in the portfolio, and weight your holdings accordingly so that the average yield equals your desired income level. Pros: It’s fairly straightforward and there’s a clear and quantifiable objective that can also serve as a guidepost when making future portfolio allocation decisions. When you’re looking to add fresh cash to the portfolio, for example, you can invest in such a way that your target yield is maintained. Cons: First and foremost, it assumes that the dividends are sustainable and will be paid as expected. 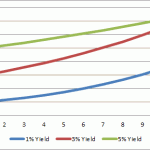 If you set your yield target too high and invest too much in ultra-high yield shares, there’s greater risk that one or more of the dividends could be cut, rendering the strategy less effective. The target yield strategy can also be a bit short-sighted, with too much focus placed on near-term results at the expense of longer-term performance. And since higher-yielding shares tend to be found in only a few sectors (such as utilities and telecoms), you may be overexposed to certain industries. 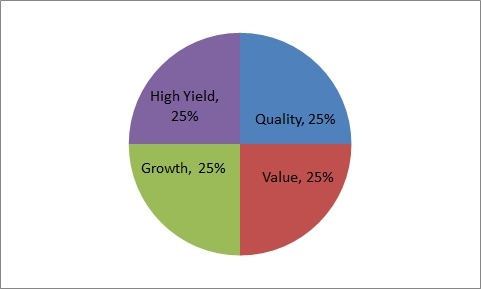 Divide the portfolio up into value, growth, high yield, and quality buckets and select shares that fit those categories. The ‘value bucket’, for instance, may consist of shares with P/E ratios at least 15% below the market average, while the ‘quality bucket’ may only hold shares with high returns on equity and low leverage ratios. Pros: The bucket approach forces you to focus on the type of shares you’re buying and helps you to avoid investing too much in one theme. You get to decide what qualifies for value, growth, high yield, and quality, so there’s a good amount of customisation available. As such, you can set up screens for each bucket that enable you to easily generate new ideas when needed or to know when it’s time to shift a share from one bucket to another. Cons: Investors skilled at identifying shares within a particular theme (e.g. deep value or growth) may not feel comfortable buying shares that don’t fit their usual strategy. Consider that value investing legend Ben Graham wouldn’t likely have bought the shares that growth investing pioneer Philip Fisher liked, and vice versa. Investing outside of your specialty can result in sub-par performance. A system of selecting shares and building a portfolio that’s primarily based on a specific screen or ranking system. The HYP method popularised by Stephen Bland and frequently discussed on Monevator is an example of this type of approach. Pros: One of the great things about the mechanical approach is that it’s simple, consistent, and easy to put into practice. Just set up a screen based on a handful of financial metrics, rank the shares based on those metrics, and build a diversified portfolio of shares that score well in the screen. Wash, rinse, repeat. Cons: A mechanical system that’s worked in the past may not work in the future. In other words, the parameters may be too rigid in a changing market environment. Also, if too much faith is placed on the screening results or the portfolio is managed too passively, you can overlook important red flags that might have been identified with a little sleuthing. This is the freestyle version – select the best dividend paying shares you can find without adhering to a specific formula or strategy. Pros: By definition this approach doesn’t have any hard-and-fast rules, so if you consider yourself a strong stock picker and aren’t concerned with generating a specific amount of dividend income, this might be the most attractive option. Cons: Some parameters can be helpful when building a dividend-focused portfolio. Going in without a strategy can also result in poor decision-making in volatile markets. Absolutely you can! This is only meant to outline a few of the major schools of thought when it comes to dividend portfolio management. If you want to combine the bucket and target yield approach, for example, go for it! How many shares is enough? Investors building dividend portfolios are often concerned about being adequately diversified across industries – and for good reason – but I don’t think you necessarily need to own one or two shares from each industry to be properly diversified. If you’re building a portfolio mainly of large cap shares, for instance, consider that larger companies are often internally-diversified. For example, Tesco has a bank division, GlaxoSmithKline has a consumer goods business, and Reckitt Benckiser has a pharmaceutical business. You might even be doubling up in certain sectors where you may not have meant to. Also, if you’re not knowledgeable about a certain industry or morally-opposed to owning certain shares (e.g. tobacco, alcohol), you don’t necessarily need to have exposure to those sectors. Personally, I’d rather own two stocks from an industry that I know inside-and-out than force myself to invest in an industry that I don’t know much about. That said, I think you can have a diversified dividend portfolio with as few as seven large cap shares. If you’re including smaller companies in your portfolio, I believe that number will probably be closer to 20 given that many small caps have niche offerings. Whether you’re starting with a large lump sum or building your dividend portfolio one share at a time, the key is to go in with a strategy and objective in mind. The four portfolio management approaches outlined above will hopefully help get you started. Please post any questions or comments below. It’d be great to hear how all you active dividend investors build and manage your own income portfolios. 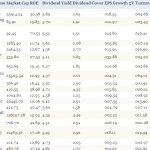 Note: You can bookmark all The Analyst’s articles on dividend investing. The archive will be updated as new dividend articles are posted. The Analyst owns shares of Tesco, GlaxoSmithKline, and Reckitt Benckiser. Personally I like the bucket approach, somehow it feels like one bucket backs up another. Thanks for giving insights on other methods. I generally have more interest in portfolio construction than I do in stock picking, so thanks for writing this post. The ‘bucket’ idea is interesting. Although I don’t explicitly use buckets, I guess my portfolio is probably a bucket portfolio because I look at all those things (quality, value, growth, yield) and have a little bit of everything. Where I would disagree with you is on the 7 large-caps = diversification. I think 7 is WAY too few. I think the fewer holdings you have the higher the probability that you’ve picked a bunch of duds and will underperform. If there are say 20 duds in the FTSE 100, if you own 50 stocks then you cannot have more than 40% of you portfolio in the ones that will do badly (assuming you don’t know in advance which will do well or badly). If you have 7 stocks then, without a statistical calculator to hand (! ), you have much higher odds of having a high number of badly performing stocks in your portfolio. Personally I think 20 is always a minimum for most people and in the last couple of years I have nudged up to 30, which for me is a good balance between effort (I check the overall portfolio about once a month) and diversification (lots of industries, lots of international companies). Still a great post though. I wish more people would spend 50% or more of their time thinking about their overall portfolio rather than most of their time thinking about stock picking. My wife’s high yield portfolio is a shave over two years old and doing rather nicely. It’s up to 26 holdings and yields 5.5% of cost price though only 4.2% of current price as I’ve had strong capital appreciation. Purchases have slowed down over recent months as everything looked too expensive. I therefore used dividends to finish off our S&S ISAs where I’ve been drip-feeding money into EM and Natural Resources as there weren’t too many other areas of value. “Where I would disagree with you is on the 7 large-caps = diversification. I think 7 is WAY too few.” Quite right: you need eight. Investing for income seems a harder game to play now – I have been at it for three and a bit years and see about 5% yield on aggregate purchase price each year but capital appreciation is more than the cumulative divi. What’s nice is that the variation in the dividend yield on purchase price year on year is low, 5% +/- .1%. this year also seems on track. However, it seems too many other people are trying to win an income from the stock market, I couldn’t see anything worth buying in that space this year, so the divi income is just accumulating in the ISA. Could you guy’s perhaps recommend well versed books on this area of investing that you’ve read and been quite helpful with the approaches you’ve taken. 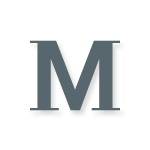 @Grand — If you follow the various links in the article above, you’ll find at least 15,000 or so words on HYPs here on Monevator to get you started, both from me and from The Analyst. @Moneyobserver: Interesting thought about sorting the buckets by time-scale. Using that approach, I might put the dividend strategy firmly in the “long-term” basket with the remaining shares considered “trading securities” and fence that group off from the dividend strategy. @John: Cheers! I’m a fan of your work. As far as the number of shares go, my line was “as few as” seven large-cap shares…so having more isn’t necessarily a bad thing. Selecting seven quality large-cap names — about one from each major sector — should be a *baseline* of diversification (I’m in agreement with dearieme’s fund manager friend here). The number may sound a bit small, but for the average investor holding down a non-investing job, juggling family responsibilities, etc., keeping close tabs on 20 different companies is a daunting task. I’d much rather know those seven companies inside-and-out than pick another 13 simply to hedge my bets. Again, if the investor can handle more than seven names, by all means do so. The average investor also likely owns funds, trackers, etc. elsewhere in his/her portfolio that can serve as an additional diversification tool. @gadgetmind & @ermine: Agreed that the dividend market is far less attractive today than it was a year-ago. In my own portfolio, I’ve made small and strategic long-term buys when a market has unfairly punished a company for a bad quarterly report, but far from aggressive buying. Good point about most investors owning things other than direct shares like funds etc, I guess 7 large-caps as the whole portfolio makes me a little nervous! Your other point about the time to manage investments is really interesting because I’ve had various comments about how time consuming it is, and how people think I must work at it all day long to track 30 holdings. The truth is very different, so I’ll have to write a post on that one to clarify why switching from funds to direct stock investments doesn’t have to come with a massive increase in time and effort spent (HYP after all is a near-zero effort strategy). I suppose I could describe myself as an “Informal Bucketist”. For me the buckets tend to be cyclical. Over the next year or two, I’ll probably be buying more of the Quality bucket than the HY or Value since I think we’ve had as a good a performance from these (not all good) as we are going to get for a while. There is always a time for Growth, but that is an intrinsically harder game, I think. I choose two shares from each sector eg AZN & GSK, BP & RDSB. I’m itching to buy consumer goods stock like Unilver, SABMiller, Diageo, Reckitt but they are too expensive currently. I’ve also opened a US broker account and planning to diversify into high quality, lower yield US stocks like Coke, Pepsi, Johnson & Johnson, Proctor Gamble, Exxon, Colgate Palmolive, GE. But for all of these i’m waiting for a market correction and good entry point. I bought Unilever, Diageo, Reckitt, and a few others that rarely count as high yield back when the US had just lost its AAA rating the the streets of London were on fire with riots. Unlike buying OEICs, you need a long watchlist and plenty of patience when it comes to buying individual equities and even Investment Trusts. Interesting article as ever. I’m really not sure which approach best describes mine – possibly a bit of all four with a sprinkling of gut feel added. My main consideration is that undefinable ‘quality company’ – the likes of Reckitt, Unilever etc – these tend to be lower yielders but I suspect over the longer term the total return will exceed some of the higher yielders. I also run a parallel portfolio of income orientated investment trusts – the likes of City of London, Temple Bar, Edinburgh etc. Although there are the extra management charges involved, I find that the IT portfolio consistently produces slightly better quarterly returns than my shares portfolio. I’m not sure exactly why – I would be interested to see some longer term research. Very nice to see you are back Mr Analyst! You’re always so helpful!! On that thought maybe you should write an article about what to do when things go wobbly — before it happens and we all come to you with lists of worries and woes! I guess I have a diverse portfolio of “bucket shares” rather than “shares in buckets”. Each holding was filtered on a range of 16 criteria covering each of the four buckets, then passed a check list, and then passed background research, including studying a few years worth of reports (and checking that promises in one report honored in following year/s). As for diversification, I have now reduced this down to under 30 shares, mainly as a result of better management from my part. At its peak I had too many holdings to admit too here! It takes me about half an hour a day to track the portfolio members, and about a day per month checking if buy / sell is needed, and about a day research per purchase (which is typically about six times a year). Finally my portfolio has been suffering from capital appreciation too, but try not to complain too much! Therefore my yield has dropped to about 4.4%, but my mean monthly income is still growing month on month, and for me that is the metric I am tracking, since it is not impacted by market whims. Remember it is the capital appreciation that gives a dividend strategy a lot of inflation proofing (especially important for when you retire and enter draw down mode). @DIY Investor (UK) — Not meaning to be offensive but perhaps your lower return for your own picks implies that you’re not as good a stock picker as the managers of your ITs? That would presumably not be a surprise, given they are paid mega-bucks for doing the job. There could be other factors at work of course, such as gearing at the ITs, the closure of discounts or even the arrival of premiums in some cases over the past few years — but given we’re into the realms of active investment with a HYP (albeit of a typically ‘passive’ kind, as the Analyst pointed out in his comment on my article earlier this week) then potential under-performance goes with the territory. Very worthwhile keeping close tabs on this. If you decide you’re not adding value with stock picks, it makes full sense in my view to go to a full IT strategy for income. Income ITs have other advantages, too, such as the revenue reserve that smooths dividend payouts in choppier times. As I always say and should write an article about, the first reason to pick your own stocks should be because you enjoy it. Where the *potential but less than likelihood* of beating the market or passive funds or even ITs comes for you and me and another reader will differ, but in my view it’s got no place at the top of the list. All the research suggests most will fail, which is why the argument for passive index investing is so strong. Don’t get me wrong, I loved having a full-blown HYP back in the day (before I became an even more active investor…) and I like running the demo HYP. I am jealous of you all with your big collections of income paying shares. But I don’t think I’m necessarily missing out because of foregone returns. I recall reading your article on swapping a HYP for income ITs one here back in the day when I was thinking about starting. When I actually started in April 2009 with a potential 2 or 3 year need for the income I couldn’t make up my mind whether to do the share thing or ITs so I sat on the fence and split my stake and did both. In some ways I look forward to the next crash when I can do just what’s recommended in that article. Investment trusts an easier ride and in particular the whole rebalancing thing gets easier with ITs once the portfolio has reached steady state from the accumulation stage. Vanguard have a fund (FTSE U.K. Equity Income ‘Index’ Fund- my quotes) which aims to take the top dividend paying companies out of the FTSE 350 in a relatively mechanical way, but with safeguards in there that seem to result in a more ‘quality’ selection of companies than IUKD does. a.m.c. 0.25%, with a 0.5% dilution levy. Many people start talking about dividend portfolios then conflates that into a yield portfolio which is something quite different. Yield reflects the current market view of the last year’s board decisions on policy. If you take the view, as many do, that today’s share price is irrelant then a simple dividend fund can be constructed in this way. Decide the unit size to invest. Allocate the first investment into the largest dividend payer. @Nathan I was educated on here that selection of dividend portfolio wasn’t particularly susceptible to mechanical selection (because of the existence of massive attractors to the method which would be value traps next year 😉 I was grouching about how the IUKD ETF didn’t do what I would have expected. If you’re gonna run a dividend income portfolio then you ride with the devil of active selection in some way. If you select on the base of dividend, not yield, then there is valuation dimension to it. Your are selecting on the basis of size only. TI, No offence taken – I fully accept my stock picking skills are not that great and certainly this could well be one reason for the under performance of my shares portfolio -v- IT portfolio. However, I would have thought the compounding effect of IT charges and portfolio turnover would perhaps cancel out the advantage of the stock picking element over the past four years. I am left wondering if the effect of gearing combined with reducing discounts during a generally rising market since 2009 may be the underlying factor. Some of the shares I will continue to hold – Reckitt, Diageo, Tesco, Unilever along with others which may come to my attention from time to time – but I will not regard it as a hyp. Thanks for sharing your thoughts, everyone. I enjoy learning about your strategies as well. However you decide to invest (ITs only, a mix of ITs/shares, shares only), be sure to keep an eye on costs. A helpful guide is to think about your annual costs as a reduction to your yield. For example, if your annual trading costs are 1% and your portfolio yield is 4%, your net yield is 3%, and so on. The less you pay to your broker or fund manager, the more capital you have left over to compound in your portfolio. Over time, those little savings all add up. In my experience, the easiest way to reduce your annual trading costs is to buy individual shares and hold them patiently. @Rob – aha I misread, apologies. That’s an interesting, and indeed also a mechanical, selection method! As some readers may know, I advocate a mix of dividend shares and fixed-income to improve volatility and to bring up the overall yield (current yield approaching 6%; I also have cash with Ratesetter @ 5.6%. ETFs might be a good way to start out for the new investor, as this gives you instant diversification; in parallel you can have a ‘fantasy’ portfolio to test you stock-picking skills. After a year or so you could start buying individual stocks/bonds. Cheers guys, can be a slog doing these some Saturday mornings so appreciate the positive feedback. Hope you’re having a good bank holiday weekend! As a dividend investor, I am probably over invested in REITS (mostly Canadian ) I am aware that REIT`s are somewhat out of favor now that bond rates are starting to climb. My REIT portfolio has fallen by about 15% over the past few months. Do I really care? They all pay every month and are the best REIT`s Canada has to offer so when the dividends come in every month I am buying more at these reduced prices. Why do I care if a particular stock is up or down if I intend to keep them over the long haul? @Wayne, I am not an expert on REITs, however, I think when the interest rates go up and it is no longer cheap to borrow, the highly leveraged REITs will continue to reduce their dividends, such panic will follow a free fall in the share price. I don’t think this will happen tomorrow but I would watch my baskets closely if I were you. Good luck !